This Ranger Stereo comes with dual speakers. It fits tubing 1 3/4" x 1 7/8" diameter. The weather resistant and durable design is just what you need. 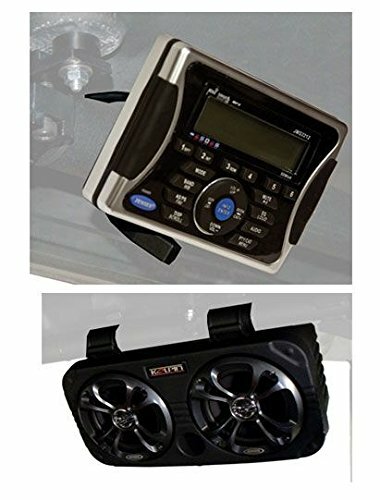 The Jensen JMS2212 is Waterproof with AM/FM/USB/iPod/iPhone components. The black box design is durable and stylish. The two Jensen speakers are 6.0" with 100 Watts of Marine Grade power. Mounting brackets and hardware is included in this purchase. Enjoy your ride with any tunes you want with this Polaris Ranger Stereo and dual speaker system. Dimensions: 5 1/8" x 3 3/4"
If you have any questions about this product by Kolpin, contact us by completing and submitting the form below. If you are looking for a specif part number, please include it with your message.